Pours a clear copper with reddish/orange hues and a rich off white head. 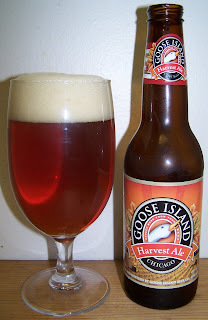 Sweet caramel malts with a citrus and pine hop aromas on the nose. Very nice ale; there is a nice malt sweetness up front, not much in the middle but the back end is very impressive dry hop finish. Make no mistake this is a very hoppy beer but it also has a nice malt balance. This is a very good ESB, it may even rival Stoudt’s Scarlet Lady. The head has diminished to a nice protective layer and it is leaving excellent lacing on the glass. You can see the level left behind from every sip. Well not quite a Scarlet Lady; it is loosing some of its luster as it warms up. At 64 degrees this is still a very good ESB. I really like the beer it’s a solid B for an ESB. Not quite sure why it’s marketed as a Harvest Ale seasonal this is a very refreshing beer that could be enjoyed year round.